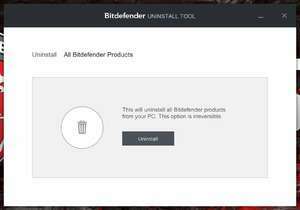 A basic installation tool, Bitdefender Uninstall Tool for Windows 10 is actually quite useful if you're intent on removing Bitdefender products for your system. As many antivirus products install themselves deep inside of the Windows system, Bitdefender Uninstall Tool is an effective solution to completely wipe your system of most Bitdefender products. The main reason for the program is to uninstall programs that don't show up in the typical Windows Programs and Features from the Control Panel. The Uninstall Tool will search for files and registry entries associated with Bitdefender products including Bitdefender Antivirus, Internet Security and Total Security. For security reasons, you should also check out the Bitdefender Uninstall Tool download at LO4D.com which includes virus and malware tests. Additional screenshots of this application download may be available, too.